We literally saw thousands of Porsches this weekend in Monterey. It was a case of overload, for sure. Everywhere you looked, there was something rare and amazing. It's hard not to get distracted by all of the myriad goings on and happenings. We managed to narrow our Porsche picks down to just twenty, so here they are, our favorite Porsches that we saw at Monterey Car Week last weekend. This 908 was once pounding around the hills of the Targa Florio. It is now campaigned by the Emory Motorsports crew, and looks mighty fine on the racetrack hills of Northern California. Only 20 of these beauties were ever built, and 10% of production was at Laguna Seca last weekend. Everything I've read says these were notoriously difficult to drive quickly thanks to a combination of a short wheelbase and a relatively powerful engine. Gunnar Jeannette, driver of the Silver #4, said that with bias-ply tires and a lack of high-speed downforce, this Porsche is actually much easier to drive at the limit than your average current-spec GT racer. The so-called "Flunder" was an interesting car, aesthetically, as it's form followed aerodynamic function. Jeannette was also driving this Porsche through the week, and commented that they were struggling with speed due to an ignition issue related to faulty MSD ignition modules. It sure looked cool on track, though. This Porsche belongs to Ranson Webster, also of Reno, NV, and I've loved it ever since I first laid eyes on it. The twin-cam engine and the insanely sculpted Italian bodywork are just so strangely cool. The fact that he races it at full chat is just icing on the cake. Part of Michelin's display at Werks Reunion, this GT4 Clubsport is just the coolest race car Porsche has produced in recent memory. I am a huge proponent of the Cayman, and I adore Porsche's mid-engine platform. Stripping it out, adding more aero, and taking it racing just makes it all the better. I've seen this 550 Spyder a handful of times, so it wasn't particularly surprising to see it sitting on the lawn of the Quail Lodge, but it sure was a treat. I absolutely adore the gorgeous lines of the 550 Spyder, and this one is all the better in a beautiful shade of French Blue. This is another Porsche that I've seen a handful of times, but the first time I really got a good look at it was Rennsport Reunion last year. The details of this Spyder are astonishing, and the influence that this car had on the following decade of Porsche motorsport is ultimately quite interesting for a history nerd like myself. This car is one of just 7 built, and was used for the SCCA Trans Am series in the mid-to-late 1980s. With gobs of boost and a well engineered chassis, this Porsche was actually quite competitive in its day. I can only imagine what it was like to drive. . I don't know much of the story of this 911, as the owner was nowhere to be found, but this custom piece is an interesting look at what might have been. Obviously the 356 Speedster was long dead by the mid 1960s, but if the concept had continued and Porsche had built a 911 Speedster it might look something like this. Look at the detail work that went into extending the engine decklid, and the custom Rudge-esque knock-off wheels. We were attendees of Luftgekühlt when the show went on, and this car was auctioned off for charity during that event. Since then, it's been blowing up social media and attending all of the major Porsche events on the West Coast. It was cool to see the Porsche again, and it certainly looks like it's getting exercised regularly. This Porsche was recently dragged out of a barn in New York state, and brought to California by European Collectibles. It's amazing that stuff like this is still "out there". Another European Collectibles car, this gorgeous Speedster has been in restoration since 2008, and was recently completed. 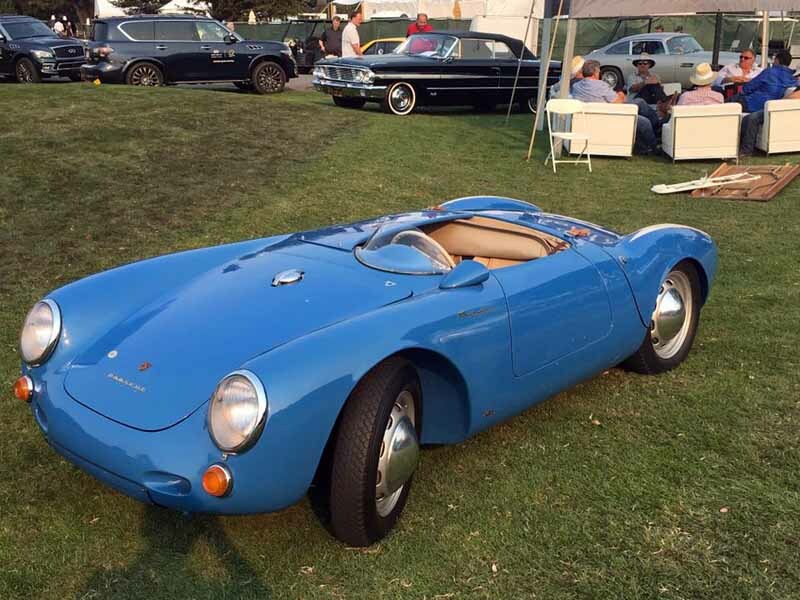 With Rudge knock-off wheels, and a beautifully detailed 4-cam engine, this Porsche won its class on the Concours. Pictures just do not do this 356 justice, it looks much nicer today than it ever would have coming off the assembly line. This Porsche was stated by the owners to be a one-of-one in this highly unique color. I've never seen another 356 in quite an ostentatious color, but it looks pretty good. The color was stated to be "Continental Orange", and one of Porsche's PR folks stated "Oh, that's the color Bruce Canepa ordered his 918 in". This one-of-400-odd cars was just spectacular to see in person. It's a rare treat to see a Carrera GT, so it was pretty cool. The Nicolas Hunziker designed Werks Reunion poster featured the 924 C GT, as the event was celebrating the anniversary of the transaxle cars. This one was immaculate, and I couldn't help but gush about it for a while. RWB has gotten a bit played out at this point, if I'm being totally honest. I still appreciate the widebody and big wing look, but it isn't often that I see a RWB built Porsche that makes me sit up and take notice. This one certainly did. A beautiful job recreating the Martini colors over silver, which I love, but adding in the orange bumpers was the key that clinched the look. And not to mention that this car has all of the go it needs to back up the show. Just check out that huge single-turbo setup. Glory! I've loved this Porsche for years, and getting to know Nicolas only makes it all the better. In all the time he's owned this car, Nic has never spent any significant amount of time washing it, but wouldn't think twice about driving it across the country. as painful as that might be to some Porsche owners, I appreciate it. As the saying goes, Porsches were meant to be driven. Dave Kealoha, a very Hawaiian man now residing in southern California, just finished this Porsche a week ago, and it is every bit as amazing in person as it looks in photos. This car is built with details in mind, and the thing looks absolutely perfect in every respect. I chose this Porsche as the "Michelin Sponsor Award" winner, having been invited to guest judge for them. Dave's car also won his class in the concours, a difficult feat in the Outlaw class that featured some truly impressive builds. Okay, yeah, it's sitting next to a 2016 911R, which is a pretty special car in its own right, but the original R will always have a place in my heart. With the Carrera 6 based engine and high strung nature and extremely lightweight build, the R was the original inspiration for our Project Boxster Clubsport. This was a true treat. We got to sit in the new 2017 Porsche Panamera. We'll tell you more about it in an upcoming piece, but for now just know that it is an absolutely amazing piece of engineering. It has, unfortunately, gravitated farther toward a Grand Tourer than a four-place sports sedan, but it's still stupidly fast, and ridiculously comfortable. Bowing to the whims of the market, Porsche has added in a bunch of comfort features that bump the car up to about 4400 pounds. I'll withhold judgement until after I've driven it, I suppose. This particular 550 Spyder was on display at Porsche Zentrum during our VIP gathering on Friday night, thankfully brought in by the Ingrams. It set a gorgeous centerpiece for the evening, and I loved looking over every inch of it. 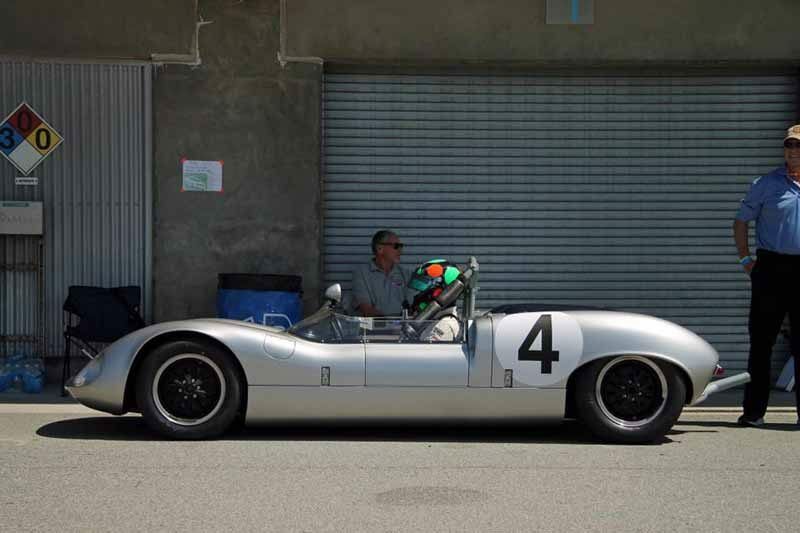 The car, one of only 90 built, was campaigned in the SCCA F Modified class for 1956 by then-owner Paul Sagan. In 1957 the car was 'Swiss Cheesed' to reduce weight, and was raced to a win at the Watkins Glen Grand Prix by legendary racer Denise McCluggage. 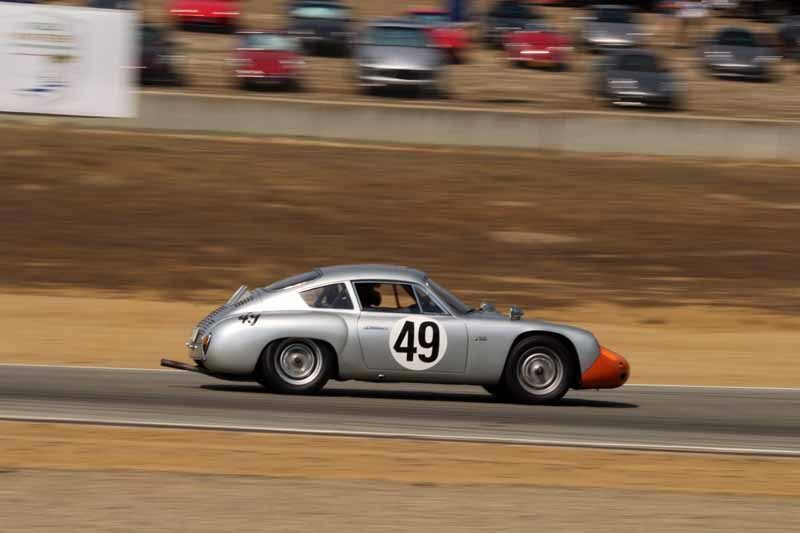 This car was Porsche's very first Le Mans victor in the 1951 1.1 liter class. It finished 20th overall at an average of just over 70 miles per hour. In 1952 the car was shipped to the US where it's first race was the Pebble Beach event that year. By that time, the owner had cut the roof off to create a roadster-style racer. The painstaking restoration was recently completed with the intent of showing it at the Pebble Beach Concours. It was amazing to see this car on the lawn, and talking to Rod Emory about the car it was plain to see that he was excited by the challenge the car presented. Not only did he have to hand-build a new roof for the car, but he had to poor over the details of the photographs from the 1951 Le Mans event to try to recreate the car in as-raced condition. We'll tell you more about this car in an upcoming piece. Suffice to say it was our favorite Porsche of the weekend. Honorable Mention: This 959 caught in traffic. What's better than a Monterey Car Week traffic jam? This 959 was stuck in stop-and-go behind a black Ferrari LaFerrari and ahead of a Maserati of some variety. The fun never ends, and I'm already looking forward to going back next year. 800 Horsepower in the Fog: Laguna Seca in a 935. Hello George P.Valerio from Lincoln,Ca. built the white 911 Speedster. Its a 1973 Targa made into what I call the (Linkster) What Porsche should have made between the 356 Speedster and the 1989 Speedster. G 50 trans,3.6 1995 engine, 993 A/C and heater, Speedster factory Top,windshield and power windows. 1975 Sport seats with head rest cut down so not to be highter then the 5 1/2 lower clam shell. Deck lid is 7 inches longer than stock and the rear Grill is 109 pices hand made. Clam shell opens with power rams and the top is held down with 2 more power rams. Thanks for the info and welcome to the site. Nice Porsche! I was quite surprised to see my car included in your list. Thank you VERY much!! (#8). However, it is a modified 1982 924 Turbo. It has 944 front fenders, 250 lb. springs in front and 944 turbo brakes, and wheels all around. The front bumper is from England. The drive train is from a 1994 968. It also has an added roll bar, Recaro seats, 5 point harnesses, and the dash has an early 911 dash top that has been covered in leather. There were at least 3 other real 924 Carreras at the event. Unfortunately, mine was not one of them. Well, I admittedly don’t have an eye for details, but you sure fooled me. Great car, and it sounds like a riot to drive. Cool all the same. The week was unbelievable to say the least. I was fortunate enough to have my car at McCalls Motorweek Revival at the Monterey Jet Center and then winning 1st in class in the outlaw division and the Michelin award just capped off a great first outing for the car. Met a lot of new friends and saw old ones as well, can’t wait til next year. Check my website, http://www.davekealoha.com for more photos. Sometimes cars are sucessful despite themselves. You’re right, of course it is a MK7. I’m terrible at Roman Numerals, I guess. In any case, the books I was referring to were “excellence was expected” and the new Porsche factory produced “Carrera”. Neither are specifically about Elvas, but Porsche in general. I’m away for the weekend, but I’ll see if I can get some quotes from those publications when I get back home. Is the black Speedster with Rudge wheels a Conv D? I had a great conversation with George, the owner of the Linkster about how Porsches were meant to be driven. He did beautiful work on that car and it shows.